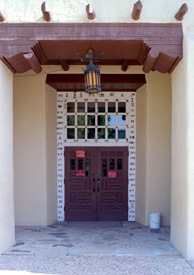 Between June, 1998 and April, 1999, the Supreme Court of New Mexico sponsored a ground-breaking project, an assessment of security provisions in the district and magistrate courts of the state. Carried out through on-site surveys of eighteen courts and a mail survey of more than 600 persons using and working in the courts, the project's results were reported in two stages. The first, based on the site visits, described 26 problems, recommended a solution for each, and proposed a strategy for achieving major improvements in the short term, while the second analyzed the results of the mail survey and added long term elements to the strategy. Under the leadership of New Mexico's Supreme Court, Statewide Court Security Team, and Administrative Office of the Courts, and funded by the State Justice Institute and the State of New Mexico, the project was carried out by the firm of Lawrence Siegel — Consultant, Court and Criminal Justice Facilities, of Columbia, Maryland. Although the project is specific to the New Mexico courts and their procedures, its approach is of general applicability and the security issues it examined are those which would be found in any state. Believing these lend the project a broad utility, we underline in the summary the essential topics and the comprehensive process for realizing security improvements.